We know you’re ready to shred this winter (we are, too). Not only will it be great to be ripping up the slopes again, but you’ll finally have a chance to try those crazy tricks you’ve been hearing about since last winter. To help you on your journey, we’ve put together this guide with 10 terrific ideas. Included are links to videos where you can see top pros pulling them off in spectacular fashion. Of course, if you are not a pro, don’t try this at home — wait until you get to the Mountain. Front flip camera grab: Olympic gold medalist Sage Kotsenburg debuted this new trick back in February on “Conan.” The video shows him front flipping during a jump over his friend who’s holding a GoPro, which Sage grabs and then turns on himself during the rest of his run down the hill. We’re assuming his friend was a bit uneasy standing still while watching Sage hurl toward him at lightning speed, but of course, the Olympian pulled it off with amazing precision. Backside Quadruple Cork. rider Billy Morgan landed what was long thought to be impossible: a backside 1800° quad cork jump containing four off-axis flips and five full rotations. The jump was completed in Livigno, Italy, at the Mottolino Resort, and was jaw-droppingly awesome. It was also one for the record books, beating the previous biggest trick — a triple cork 1620, landed by Yuki Kadono at the U.S. Open Slopestyle — with one full flip and half a rotation more. Definitely a top contender for trick of the year. Redbull has the Video here. The Miller Flip. The Miller Flip is a snowboarder’s favorite trick. Whether you’re doing it off a jump, over a knuckle, or a step down, the miller flip always looks steezy. Bode Merrill is the king of the Miller Flip with one foot and double flip variations. One foot Miller Flip at 1:45 and the double Miller Flip at 3:00. Video here. The Carve Flip: Alek Oestreng pulled this off during a run while filming for #RK1, seemingly with no warning. His carve starts unassumingly enough for several seconds before an effortless-looking 540° flip takes his game to a whole other dimension. Video here. Backside Triple Cork 1620: Canadian Mark McMorris pulled off this stunt during January’s X Games, earning himself a score of 98 and gold medal with an impressive set of triple corks, including a backside 1620. Video here. The Holy Crail: Sage Kotsenburg makes his second appearance on the list with his Holy Crail, a move that has him rotating and 4 ½ times while reaching back and grabbing the edge of his board. No easy feat, but Sage makes it looks simple. The trick’s name went over so well that TransWorld SNOWboarding created a same-named series of episodes that follows Sage as he rides. Video here. Buttering by Nicolas Müller: Arguably the king of butterville, Swiss rider Nicholas Müller adds another doozy to his repertoire that keeps him practically vertical for several seconds. Perhaps it’s better seen than described. Video here. Danny Davis McTwist: Shown off at Aspen’s X Games, this long-held, supercharged McTwist represents Davis’ signature style. And the judges agreed — awarding Davis a gold medal in the SuperPipe. Video here. Back-to-Back Triple Corks: Despite being overshadowed by Billy Morgan’s Quad Cork a few months later, the back-to-back triples landed by Japanese rider Yuki Kadono at this year’s Burton U.S. Open in Vail were equally worthy of praise, especially since that has never done before, Yukiwowed the crowd with his triples securing his place as winner. Video here. Rodeo to Board Slide 270 out. Seb Toots is always throwing down massive tricks in the street and in the park, but nothing was bigger than his banger at the end of his 2015 x-games real street edit where he threw down a Backside rodeo method 450 to a front side board slide 270 out. You have to see it to believe it at the 1:20 Video here. What tricks do you plan to throw this winter? 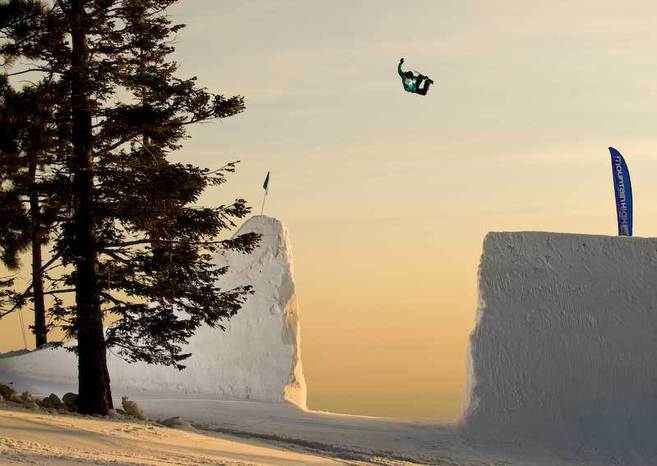 And what are your top contenders for trick and snowboarder of the year? Let us know in the comments. We’ll see you on the Mountain.